Not Roger himself, but someone he may or may not have known. Roger F. Jollieman, 78, of Uptown Bass Lake, was launched peacefully into the stratosphere and onward to heaven like an unidentified flying object Feb. 27, 2016, with many family members and friends and acquaintances at his side or less than 25 feet away. Roger was born Jan. 15, 1938, south of Bass Lake, to George and Helen (Jollieman) McEntire. Early on, his parents legally changed his surname to his mother’s maiden name, for undisclosed reasons they took to their graves in May 1981 and September 1988, respectively. Roger was known for his dry humor. “The humor wasn’t wet, that’s for sure,” one family member said. (The family member who said it was Roger). Roger was a student at Bass Lake schools, and a good one at that, his mother used to say. “Straight-A student, type-B blood type,” she once said, dryly. On June 17, 1961, he married Melvista Clanahan in a private ceremony in Las Vegas. Melvista (not her real name) preceded him in death. 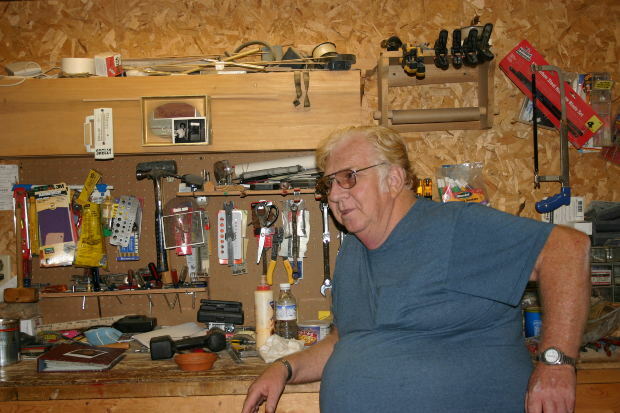 Roger was a part-time, avid tinkerer and sometime inventor. His crowning achievement was receiving a patent for a device he called “The Thasmegoritran.” A practical use for it was never established. His employment history is available upon request. Surviving are 3 children, Bob (Mary) Jollieman, Rob (Mary) McEntire (he changed his name back to his grandfather’s) and Mary (Rob) Smitherjones, and their children and their children’s children, if that applies; a nice workbench; and others. Barely surviving is an aunt. He was preceded in death by his parents; his wife; and at least a half-dozen cats, some of whose names he never bothered to learn, since he was a “dog person,” as his mother usd to say. No visitation is planned. A service is planned, though, and that service is planned for 1 p.m. Wednesday at Outsiders Funeral Home, 3711 W. Central Hwy. Contributions are not necessary, as his mother used to say.